You'll have to turn your computer sideways if you want to see the 'C' correctly, but I figured you all were smart enough to see the 'C', right? I'm betting you all are going to think I have an obsession with googly eyes...and it's true. I do. There's just something about those wiggly things that make a craft so.much.cuter. Trace and cut an uppercase 'C' out of the foam sheet or construction paper. I used a foam sheet that was about 4" x 5" in size. Cut out two 'claws' for your crab. I didn't use a pattern, just freehanded it. Cut out four long, skinny rectangles to use as 'arms' and eye extenders for the crab. Glue the legs and eye extenders onto the back of the letter 'C'. Flip the crab over and add the eyes and the claws. so cute! 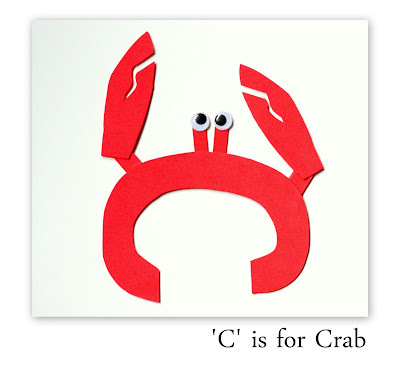 I am working on C this week with Sammy and we are making a crab tomorrow so this will be the idea I use :-)! Thanks! One question.. whats the black pipe cleaner for thats listed? you should see how many googly eyes my LO put on her #8 spider for totally tots once upon a book post! :) you'd love it ! I love this crab - so cute. Might make it for our next sea creatures theme. I love your blog. I feel strongly that I want to home school my boys, though my oldest is only 2. There are so many helpful links on your blog. I feel a little overwhelmed as to what curriculum to use or method to do. I've got time. Thanks again. This turned out so very cute! You are very creative. I wanted to let you know that I featured this craft on my blog. I also gave a link over to Totally Tots where people could find your other Alphabet crafts.